Sharing how to do this trail within 20 days, while including Half Dome and Clouds Rest! If you have the additional Half Dome Permit, check the weather for this day and the next to determine which day to complete Half Dome. If the weather is clear on the day you start, do the 4 mile Half Dome “detour” once you get to the Half Dome junction. From the junction, you have a half mile to Sunrise Creek Campsite to spend the night. If the weather is better the next morning, set up camp at Sunrise Creek and then backtrack early morning a half mile each direction to the Half Dome junction for a total of 5 miles before starting the plan for Day 2. The bonus of doing Half Dome in the morning is that it won’t be busy with day hikers…yet. They still have a way to go coming up the Mist Trail. I highly recommend taking the Clouds Rest route which is NOT the traditional JMT. At Sunrise Creek campsite, you are at a junction point between the Clouds Rest trail or the JMT trail (both will get to the same place so there is no backtracking involved, but it does add 3.8 miles). Don’t worry if you decide to pass on it, we met so many people doing the JMT who did not do Clouds Rest. You can do it as a overnight hike another time. The traditional JMT route will be 3.8 miles less than what is calculated for this day. With the first 2 days being so challenging, (the climb out of Yosemite on the first day and Clouds Rest on the second), Cathedral Pass will be a breeze and having a shorter day will be necessary! Tip: If you wanted to have the lightest backpack ever during the tough Yosemite part of the trail, look into a resupply at Tuolumne, which you would pick up on day 4! We opted for the last campsite before Donohue Pass. It is about 800 ft of uphill at the end of the day, but you will thank yourself the next day when you cut a good chunk of the next day’s uphill, had a great water source, a more private campsite, and less mosquito bites. You will get reception at the top of Donohue pass! Passing through Ansel Adams National Forest after the pass was my favorite section on the entire trail! We took our longer stop at Thousand Island Lake. It is a busy place to camp, but a birds eye view above the campsites is the best for a little rest and snack. About 2.5 miles past this is where I recommend camping: Garnet lake. It has a similar view to Thousand Island Lake, but you will feel like you have the place to yourself since everyone had their own cliff to perch themselves on without being visible to each other. This is the day that most people try to reach Reds Meadow so if you reach Reds Meadow on day 6 and did Clouds Rest and Half Dome, give yourself a pat on the back! The day is mostly down (which can be good or bad depending on how you feel about it). We thought it was good, especially since the grade down wasn't so steep. We stopped to see Devils Postpile National Monument which are basilic collumns. After such a long day, we weren't impressed and continued on without even taking a picture. You can plan ahead to eat dinner at the Reds Meadows Resort (you'll find a few cabins, a market, and a diner here), but they do close at 7pm. The walk from the resort to the campground is about a quarter mile. There are options for laundry, showers, charging outlets and cell service that you can take advantage of here. From Reds, we had a late start, enjoying the ability to get a connection; but it is quite hot and desert-like on the trail after Reds (no trees for cover) so I see the benefit of starting before the sun gets hot (and maybe taking advantage of having service the night before). Purple Lake is, again, a more secluded campground. The most popular points for people to stay were Deer Creek or the junction point for Duck Lake (lots and lots of tents set up as we passed by), but we knew we could push on. At the junction point when you get to Purple Lakes, we found the best sites were if you kept following the trail (to the right). From Purple Lake to Silver Pass Lake, it is mostly up, but the grade is well-done so it didn’t feel too challenging (plus, we were getting stronger and our bags lighter). The lake before climbing Silver Pass and the view from the top of Silver Pass was my favorite at this point on the trip. We also enjoyed the shorter mileage and getting to our site early to have dinner before the mosquitos came out. This day is probably the most monotonous. You have a big down and also a big up. The grade is steeper than it has been for both, making it long and not very exciting, as you are in trees for most of the day. The campsite here is also before one of the bigger river crossing so you can do that in the morning after plenty of rest and with adequate energy levels. Our one and only resupply was at Muir Trail Ranch (MTR). Heading to Muir Trail Ranch means a bigger day and there is a bit of pressure to get there before their resupply station closes at 5pm (their hours are 8am-5pm). This option is preferable if you are running low on food, really want the snacks you packed for yourself, or want to go through your food (pack it well in your bear bin at night) and then leave it to the next morning to go through all the donation bins (trust me you will want to, even just to trade out things you don't want to eat anymore). You may also want to go to the hot spring at night (note that this involves a river crossing). Camping at Sally Keys instead means a better campsite (less busy), less of a hike (you postpone 4 miles of downhill till the next day), an option for a mid-day dip at your campsite's lakes and postponing the hot spring near MTR till tomorrow mid-day or not at all, and requires you to sort food and look through the donation bins at the same time. Whether you camped at MTR or not, you will likely spend a good amount of the day there. Many people spend 2+ hours sorting and packing their food. I enjoyed spending the entire morning (starting from the second it opened) to go through the bins as everyone was donating their food! I ended up eating all the dried fruit and all the vegan bars I could find as my lunch that day (finally leaving at 1:30pm). I also scored some oatmeal packets, chocolate, and about 13 bars that I managed to fit in my bear bin! If you leave Muir Trail Ranch with plenty of time, go further to camp at McClure meadows and then Wanda lakes the next day. (Spacing out the mileage a bit better). Evolution Lakes is SO stunning. This area is notorious for thunder and lightning storms, so it is also safer than the other two lakes you could camp at if you went further (Sapphire Lake and Wanda Lake), which are very exposed with no trees. Depending on the season, be aware that the trail can be difficult coming down the other side of the pass due to snow covering the trail (people use GPS early in the season). Also, this was a long day so be ready! We anticipated this day to be average; however, there is something called the Golden Staircase which was absolute torture! It is steep with no abiltity to know how much further you needed to go so my advice is to fuel your body for the day with adequate snacks! The pass wasn't too bad and it was scenic all the way down. 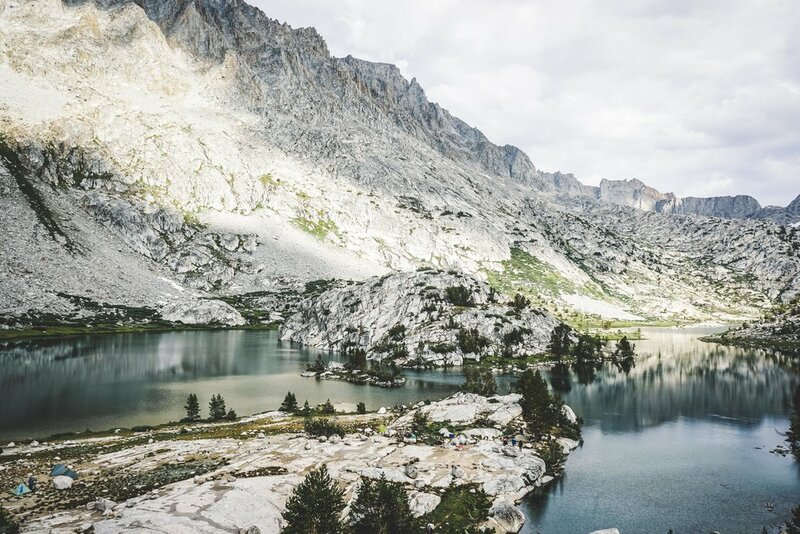 There is a popular curcuit that people do over Glen Pass, which makes the campsite at Dollar Lakes busy with hikers not doing the JMT, but the lake was another stunner and we enjoyed it! The passes begin to provide spectacular views! Forester pass is the highest one yet and can be a little daunting if the weather doesn't hold up (strong winds, etc). Guitar Lakes is the best place to camp before the Mt Whitney since it is the last place you can get water and use the bathroom without using a bag. You are about 2-3 miles from Trail Crest at this point, which is where you will ditch stuff you don't need for the Mt Whitney summit. Try to get to bed early this night and have your bags packed so you won't be too tired waking up at 1:30am the next morning to hike up for sunrise at the top of Mt Whitney. Take all your layers (gloves, hat, puffy jacket, etc), sleeping bag, headlamp, water and snacks to the top of Mount Whitney and leave everything else in a pile at Trail Crest before summiting. Exit the trail at Whitney Portal. It makes for a very long day, but since you start at 1:45am, you will finish around 4pm!